Arianespace's next Ariane 5 flight has been authorized for liftoff on June 16 following the launch readiness review on June 14, which was conducted at the Spaceport in French Guiana. This milestone confirmed that the heavy-lift launcher and its dual-satellite payload are flight-ready, along with the Spaceport's infrastructure and the network of downrange tracking stations. With the approval granted, Ariane 5 is cleared for a June 15 rollout from the Final Assembly Building to the ELA-3 launch zone, where the launch vehicle will be readied for liftoff on June 16 during a 1-hour, 10-minute launch window that opens at 5:30 p.m. local time in French Guiana. The mission is designated Flight VA230 in Arianespace's launcher family numbering system, notating the 230th Ariane launch since this series of European-built vehicles began operation in 1979. This will also be the 86th flight of an Ariane 5 from French Guiana, where the vehicle is operated alongside Arianespace's medium-lift Soyuz and lightweight Vega. EchoStar XVIII is the mission's upper passenger and it is to be orbited for operator DISH Network L.L.C. The spacecraft features a high-power, multi-spot beam in the Ku-band to assure the highest levels of ongoing service to DISH customers in the contiguous United States, Alaska, Hawaii, Puerto Rico and Cuba. 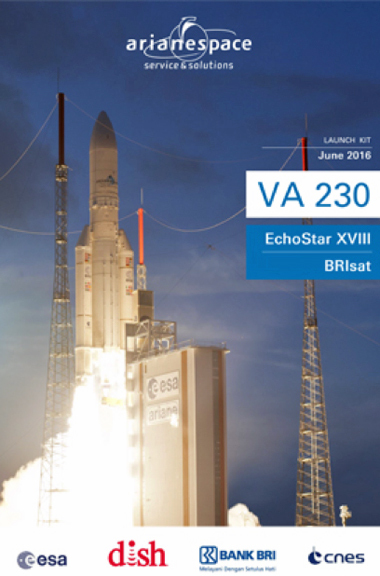 Joining EchoStar XVIII on Arianespace's next mission is BRIsat, a milestone payload for P.T. Bank Rakyat Indonesia (Persero) Tbk. (BRI). As the world's first dedicated banking communications satellite, it will provide enhanced secure banking communications for more than 10,600 operational branches, as well as to some 237,000 electronic channel outlets and nearly 53 million customers across the Indonesian archipelago. Both the EchoStar XVIII and BRIsat relay platforms were built by US-based SSL (Space Systems Loral) and are to be delivered by Ariane 5 into geostationary transfer orbit.